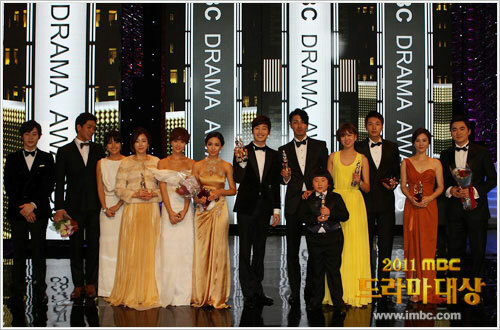 MBC TV held its 2011 MBC Drama Awards ceremony on the night of December 30th, 2011, ahead of rivals KBS and SBS TV station. The MC hosts for the 2011 MBC Drama Awards ceremony are Jung Jun Ho and Lee Ha Nui (Lee Honey), the Miss Universe of South Korea in 2007. As announced by MBC, the Daesang has been changed to Drama Award of the Year, and will no longer been awarded to an actor or actress. Instead, the Daesang Award been awarded to a hit drama series, The Greatest Love, as Drama Award of the Year, replacing the Best Drama of the Year Award at 2010. 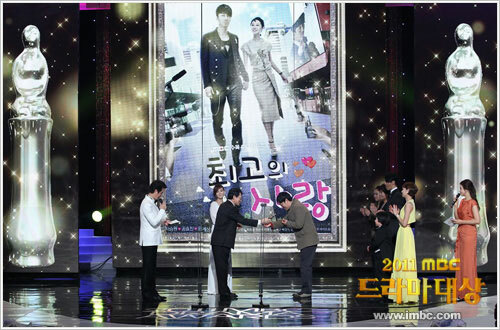 The whole production team and cast members of The Greatest Love who attended the event went up on stage to accept the Drama of the Year award. Kong Hyo Jin ‘awarding herself’ the Top Excellence Award for Miniseries division as she is the presenter for the award. Here’s the complete full list of the 2011 MBC Drama Awards’ winners. Host MC of the 2011 MBC Drama Awards open the ceremony with dance.